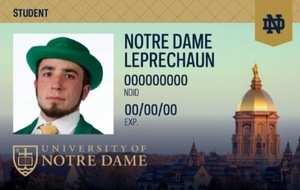 The story for Notre Dame’s Irish1Card is the same for many campuses: mag stripe has remained the de facto card technology for decades for it’s reliability and lower price tag. The caveat, however, is that mag stripe lacks the robust security features that more advanced credentials now provide. In fact, the primary aim for the new Irish1Card as it transitions from mag stripe to chip technology is to introduce greater levels of security. Beginning in June, all cards issued by Notre Dame’s campus card office will feature both a contactless chip and a magnetic stripe. A common method for campuses that choose to upgrade card technologies, this approach enables the cardholder community to adjust to the new contactless technology in stages as opposed to right away. Campus Dining facilities and select campus residence halls will be among the first campus locations to implement the new contactless features. Going forward, the new Irish1Cards will retain a magnetic stripe until all campus readers are completely transitioned to contactless technology. The full campus-wide upgrade is estimated to take 3-5 years at which point the mag stripe will be phased out completely. By late summer the Irish1Card Office will begin the re-carding initiative to replace student, faculty, staff, spouse and affiliate cards. The re-carding is set to take place in stages with new and returning students among the first to receive the new contactless cards. Faculty and staff will be able to obtain the new credential beginning in September after the initial student rush has ended. The re-carding will also give students and faculty the option to update their ID photo. Cameras will be deployed at the issuance locations, and for cardholders whose photo on file is more than 5 years old, a new photo will be required. There will be no charge to exchange the old ID card for the new Irish1Card, but for those who do not have their current card to exchange, a $20 replacement fee will be assessed. The updated Irish1Card will also boast a new aesthetic design for which the university was awarded NACCU’s Best Card Design Award at the recent Annual Conference in Orlando, Fla. The new Irish1Card design includes the university’s academic mark in gold foil, along with a tactile impression of the university seal.